My Christmas Card -- A little late!!! I hope you all had a marvelous Christmas and Hanukkah! Well, the good news is that I mailed my cards on time (at least, before Christmas!). The bad news is that I didn't share them here before the holidays. 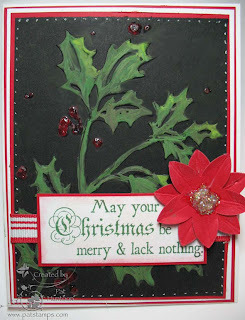 So I am sharing both cards I made here today -- better late than never! The card on the right is a Herringbone Card, from the December 2009 issue of the Technique Junkie Newsletter. 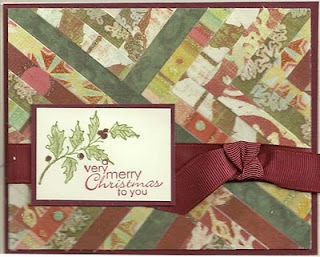 I made 40 of these cards....paper pieced each one. This was certainly a labor of love! 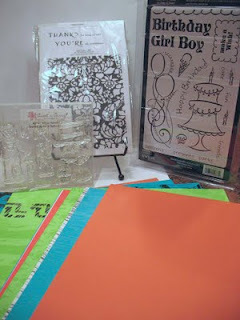 The paper is from Basic Grey, and the stamps are from Stampin' Up!. One more thing about Herringbone -- rest assured that all the Herringbone cards posted to the TJ group will be included in the contest. Gorgeous work so far! If you want to enter and have not posted to the egroup, post a card to the group or send it directly to me (no need to do both). On a personal note: I had company from December 17th (or was it the 18th? I lost track!) until this morning. I haven't been able to dedicate myself to TJ, my blog, or anything online for 11 days! I had DH's family here over the weekend, and parties, too... not much time for much else. I am NOT complaining -- my MIL helped me make cookies, Christmas dinner, and she cooked for me (or along side me) the whole 10 days. Plus she did soooo many dishes and shopped with me too. It was almost like having a wife! I am thankful and grateful to have a loving relationship with her; she helps fill the hole in my heart that was left when my mom passed. We are going away again New Year's Eve, too -- so if you don't hear from me, you will know why! I will try to post before then, though...the last giveaway of the year! Take time today to tell the ones you love that you love them. Paper, Paper, Paper. No-one does it better or has a more exquisite variety of paper than The Paper Temptress! As our giveaway sponsor this week, The Paper Temptress is offering two sheets of her newest cardstock for one lucky winner! 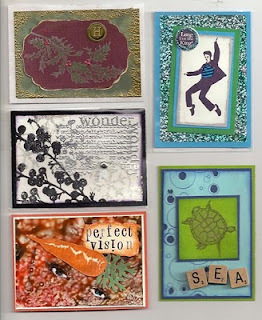 To give you even more variety, and maybe a few ideas, the winner will also receive the 5 ATCs shown at right. Each were made by me this year using a Technique Junkie Technique and Paper Temptress paper! 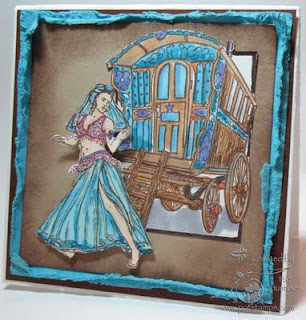 From Patricia, THE Paper Temptress: "Paper Temptress has been very busy adding 31 new fabulous sheets to an already extensive line of cardstock. Two fabulous sheets of Kromekote Ultra High Glossy Textured in both Canvas and Silk finishes! I am very excited about the new colored Brown Bag Kraft which is double sided, fabulous colors on one side and the perfect Brown Bag on the other side!! Perfect for embellishments, cute little gift bags, the list goes on and on. Two different weights of Clear Cardstock, the heavy weight would make great album covers, heck you can even use it to store unmounted stamps! I will even punch the holes in it for you. Two new stunning pearl finish linen sheets in both gold and white pearl, the prettiest texture paper I have ever seen! 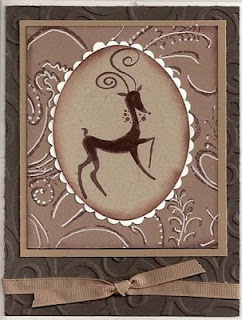 Wow, I could go on and on but just follow this link to be awed by all the new cardstock added. To introduce this cardstock to Technique Junkies I am offering a giveaway of 2 sheets of each of the new cardstock so be sure to enter by following this link and then comment on what technique you would use with this newest cardstock." To enter this giveaway, leave a comment on this post by end of day Sunday, December 27th. I will use my random number generator to select the winner. Please remember to identify yourself fully -- Blogger does NOT allow access to your name easily. Anyone can enter, anyone can win. On a personal note: It has been forever and a day since my last post -- I apologize! The holidays have had me spinning, and I have company for two weeks this year -- starting last week Thursday through next week. Although I AM enjoying the company of my in-laws, it does throw stones into the Technique Junkie Machine. I haven't stamped for pleasure for weeks! I do have some things to share later this week again, so stay tuned. Once again, Merry Christmas and Happy New Year! Congratulations to Lori Smanski, the winner of this giveaway! October Treasure Hunt - Final Stop! 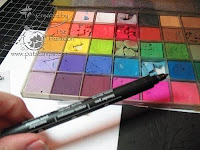 Welcome to the October 2009 Technique Junkie Newsletter Treasure Hunt! If this is your first stop, you may want to start on the TJ Design Team Blog HERE to start following the clues to the Treasure Chest below. If you have followed the hunt -- you are looking for your final clue here -- and that is the letter G. Now you should have a completed word for the Treasure Hunt and can win the drawing prize! 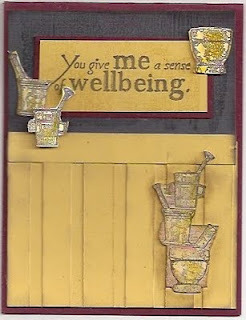 The card on the right features a Rubber Thwamping Background (October 2009 Technique Junkie Newsletter) with a Block Collage Foreground (February 2009 TJ Newsletter). I added some Diamond Glaze (Crystal Effects) over the word "pumpkin" to make it pop, plus a flower, a Cuttlebugged piece covered with fibers, and a button to top it off. All of the fabulous stamps on this piece are from Club Scrap (Use tjstamp on the Club Scrap website for 25% off unmounted rubber, too!). October a special birthday month -- the first issue of the TJ Newsletter was published in October 2002. In celebration, there is a huge set of Birthday Stamps from Inque Boutique. 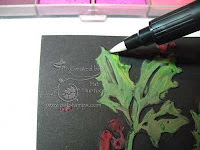 One of my favorite techniques in the October newsletter is Burnished Backgrounds -- and you will love using the Batik Flower Background from Innovative Stamp Creations to try the technique! (Remember, use TJ10 for 10% off at ISC, too). You will also receive a pack of 25 glorious Salsa papers from Club Scrap. There is a nice mix of 12" x 12" and 8-1/2" x 11" papers there for you to have fun with! And finally -- the winner of the hunt will receive a free year of the newsletter OR any CD from the Technique Junkie Newsletter collection. Woo Hoo! To enter the hunt, leave me a comment below with the "key" to the treasure box (the word you collected along the way). Note that your comment will NOT show up -- I have comment moderation on because of the "key." 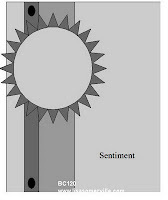 Make sure that you leave enough information so that I can contact you to let you know you won. Just a reminder that Blogger does NOT leave me your email address. A great way to do this is to leave your email address in a spelled-out way, such as "p huntoon at optonline dot net." I will use my handy random number generator to pick the winning entry. You do NOT need to be a TJ subscriber to win. Comments must be entered by 9am EST Friday October 30th. Good Luck! Look, Ma - no layers! Today's Blogger's Challenge was to use no layers on our cards. No layers. Hard for paper fanatics! Luckily for me, I know one or two techniques to pull me through this "crisis." And I love COLOR, so no plain white card for me! I decided to use the Mono Masking Technique from the February 2009 issue of the Technique Junkie Newsletter. I am so happy with the results! 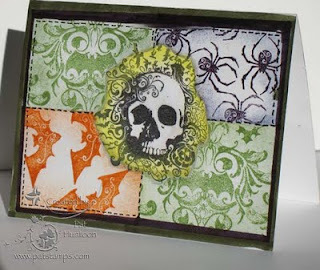 I love these "From the Crypt" Stampin' Up! stamps, too. Hmm...who'd ever think that I could use the words "Love" and Crypt" in one sentence? In honor of the series, I made the vintage card, at top, using some of the images from the stamp sheet. The background is Embossed Crayon Resist using one of my shimmery copper Moonglow mist sprays (technique from the October 2009 issue of the Technique Junkie Newsletter). I just love how these stamps look with the background! Artistic Outpost is now carrying Neenah Solor White, Neenah Ivory and Kromekote Coated Glossy Card Stock - click here for more details. So how do you become the lucky winner of this giveaway? 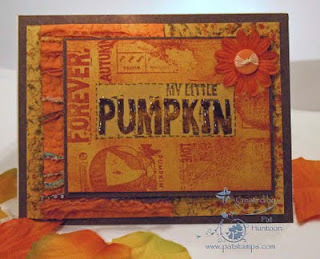 To win this card and the stamps, simply leave a comment by Monday, October 26th at 9am est. If you are so inclined, tell me who your are rootin' for in the series! The winner will be selected on Monday morning. Make sure that you leave enough information so that I can contact you to let you know you won. Just a reminder that Blogger does NOT leave me your email address. A great way to do this is to leave your email address in a spelled-out way, such as "p huntoon at optonline dot net." I will use my handy random number generator to pick the winning entry. You do NOT need to be a TJ subscriber to win. Good Luck! To celebrate nature's most beautiful painting, this week we are giving away these awesome stamps from Innovative Stamp Creations. They are some of the loveliest leaves in my collection -- and are fabulous to color with Copic Markers, Watercolors, Chalks, Watercolor Crayons, Colored Pencils...you name it! 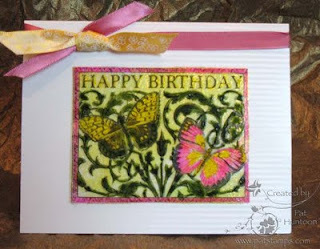 The example I made with the stamps that will be given away with the stamp set below uses a variation of the Crinkle Technique (October 2009 Technique Junkie Newsletter). 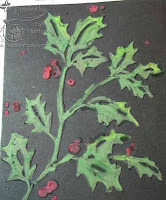 I layered a Shape Spotlight (December 2005 issue) of the Copic-colored oak leaf and then cut it out so that it has an Out-of-the Box feel (October 2004 issue). I guess after 7 years and 550 unique techniques, it gets easier to use alot of them on one card!! 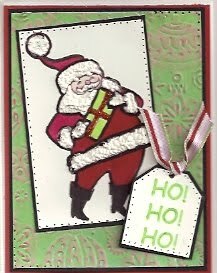 Don't forget that Innovative Stamp Creations is a Featured Vendor -- Technique Junkies receive 10% everything with the code dec09tj. Have you seen the new Christmas sets from Betsy? They are wonderful! Can't you just see that ornament in the middle of the Joyful Christmas set done with Paper Piecing? So how do you become the lucky winner of this giveaway? 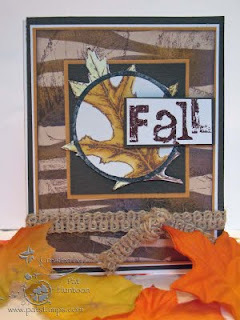 To win this card and the stamps, simply leave a comment by Monday, October 19th at 9am est. 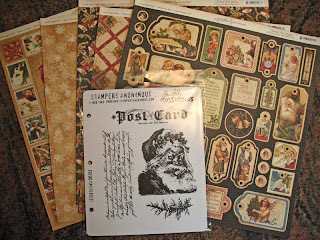 If you are so inclined, tell me how you would use these stamps or the Christmas stamps on the ISC site. The winner of this set of stamps is Candy Meyers - Congrats, Candy! Do you live near Stamford? On Saturday, 10-17 I am having a tag sale -- and I am selling tons of stamps and scrapbooking supplies, along with other personal items. If you are close to Stamford CT and would like to stop in and say hello, please email me for my address and I will send it to you. It's Friday and I am just sliding in with this submission for today's Blogger's Challenge. 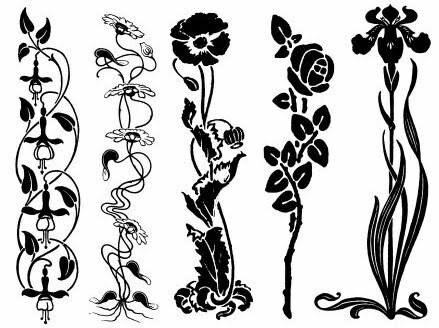 Today the challenge was to use the sketch below as inspiration for our card. I chose to use a Decorated Pretty with a Faux Turquoise Stone Center. Both Techniques are from the October 2009 issue of the Technique Junkie Newsletter. 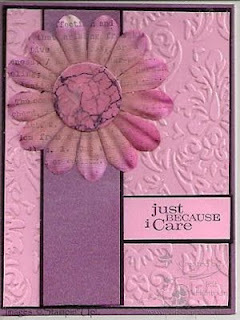 The saying stamp and stamp on the flower are from Stampin' Up!, the stamp on the pink Faux Turquoise is from Stampendous. 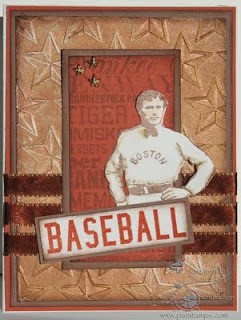 One of the things I did with this card that doesn't show in the scan (and that I could not get a good picture of) is that I outlined each of the embossed areas with glitter pen. Holy cow, this is a gorgeous card in person! I did not put the extra brad-like things on the top and bottom of the vertical panel, either -- they just seemed superfluous with my design (although they look great on the cards from the other players!). I hope you have a great weekend. If you have a few minutes, check out the artwork from the other Blogger's Challenge players -- the link to each of them is on my sidebar. It's my birthday, so let's have a giveaway! Yes, my birthday. Not something I like to talk about normally, but today, since I am giving something away to celebrate it, I don't mind so much! 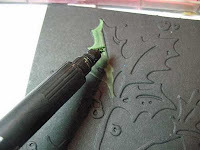 The card uses the Angelina Fiber Under Glass Technique - one of the Bonus Techniques on the new CD (7th Edition) from the Technique Junkie Newsletter. In addition, I used a variation of the Gel and Acetate Technique (August 2004 edition) to color my image. The stamps are from Sweet Pea Stamps (more about Sweet Pea below). It is gorgeous in person! It has dimension AND shimmer. 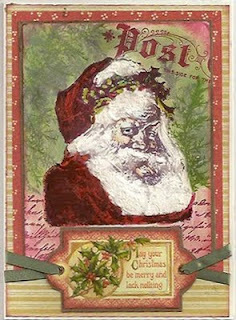 If you notice, I did not over-embellish this card, because I used Paper Temptress's Laser Lustre Paper in the background -- believe me, it is so beautiful I didn't need anything else! To celebrate their debut with us, Sweet Pea Stamps is offering a free mini grab bag of stamps with every purchase. There is also a sale going on right now -- through the end of the week -- and free shipping to the US and Canada. Just make sure to write "TJ Order" In the comments with your order to receive the free stamps. I have to tell you that I personally just "discovered" Sweet Pea Stamps. I saw Lynette post on some images on another egroup, followed the link, and fell in love! Well it seems that Lynette has been in the stamping world since 1999, took some time off, and opened Sweet Pea Stamps in April. 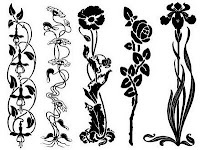 There are some really cool stamps on the Sweet Pea site -- from the "Gum Drop Gang" to the "Sweet Pea Pals" to the elegant stamps above. I love "finding" new providers for my "fix"! So how do you become the lucky winner of this giveaway? 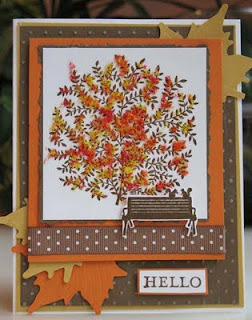 To win this card and the gift certificate, simply leave a comment by Monday, October 12th at 9am est. The winner will be selected on Monday morning. Make sure that you leave enough information so that I can contact you to let you know you won. Just a reminder that Blogger does NOT leave me your email address. A great way to do this is to leave your email address in a spelled-out way, such as "p huntoon at optonline dot net." I will use my handy random number generator to pick the winning entry. You do NOT need to be a TJ subscriber to win. Good Luck! The winner of this set is Barbara Washington. Congrats, Barbara!